Chief engineer Dave Broom tastes six new single malts from Loch Lomond Group this week, including three from Glen Scotia in Campbeltown, and three from the Highlands: two Inchmurrins and a Loch Lomond. A medium- to full-bodied nose with a light earthiness that brings to mind wormwood and gentian. Dried lemon peel then leads into lots of cumin and turmeric, bringing to mind a spicy fruit chutney. With water, it becomes more raisined and sweet (this has been finished in a Pedro Ximénez cask). Rounded and generous, with a sweet mid-palate which helps to blur the tannins. The palate doesn’t quite reach the weirdly wonderful nature of the nose. All change at Glen Scotia… and the ‘interesting’ wrap-around Highland cow bottle has gone. Well worth a look. A well-upholstered country gentleman eating a cheese and chutney sandwich. Ripe, sweet and soft. Medium- to full-bodied, with a little more cask influence here than on the Double Cask, allowing it to be more crisp in nature. Thick and still sweet, with rum-and-raisin ice cream, then whisky-soaked fruits. Good weight, with structure given by a clean nuttiness. Supple and very sound. Water perhaps lightens it too much. Clean and soft when neat, a little dusty with water. A very decent dram indeed. The clocks go back. Out comes the fruit for the Christmas cake. Bigger and sweeter than the previous pair; there’s also a hint of smoke in here which could be from the heavily charred finishing casks. There’s liquorice, jammy fruits alongside pine/larch, Seville orange and light nuttiness behind. Nice layering. A ripe, sweet start, then some Parma Violet, cooked fruits, plum jam and a treacle-like undertow. Well-balanced and, while it’s fat, there’s good, sound structure here. Maybe just a little firm. 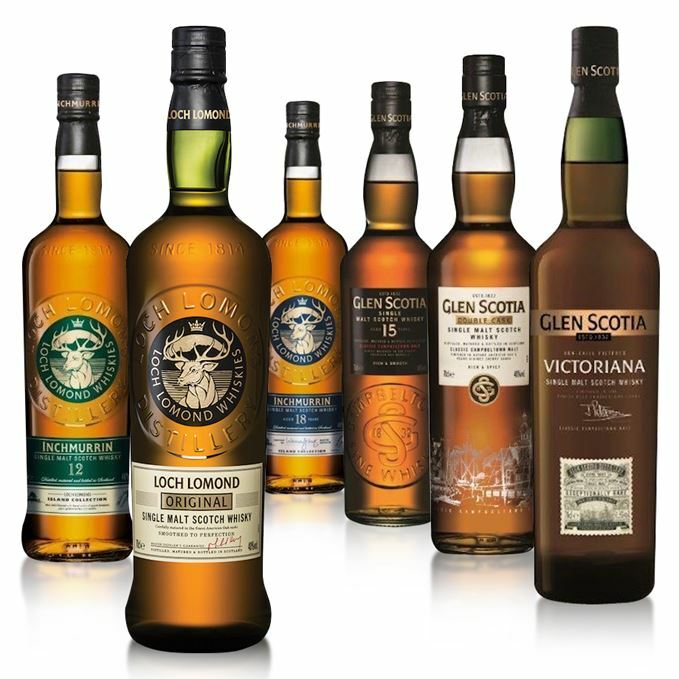 Make no mistake, Glen Scotia is back. A fine conclusion to a very heartening new range. A Women’s Institute stall at the church fete. Big and sweet, with masses of fruit and a hint of mint. Becomes quite juicy before a really lovely oaky note adds a warm toastiness – think of toasted crumpets with butter and honey. Water makes it considerably fruitier. A fruit bomb. You are immediately plunged into blackcurrant fruit pastille, then carried forward to mango and and papaya before a perfumed element develops alongside citrus. Water means that you lose this frankly outrageous burst of flavour. Has power and some weight. Aged in refill, first fill, and recharred American oak casks, you can’t drink this without a stupid grin on your face. Sailing out of control down Willy Wonka’s river while Oompa-Loompas fling buckets of fruit at you. Stewed Assam tea, some wet grass and fruits behind. Does show some heft and in some ways looks to Original (see below) while having some of the fruitiness of the 12-year-old. Mature with a little hint of Danish oil and, with water, big tropical fruits. Good control of distillate and oak allows the fruits to balance themselves against the fat, slightly oily, distillery character. When diluted a light cereal nuttiness develops. Hint of pepper and nutmeg. Cutting the grass on an autumn day with a mug of tea and a jammy piece on the side. Bready, in fact almost yeasty, with notes of warm (and slightly soggy) Weetabix, sweet nuttiness and, in time, suet pudding dotted with fruits. Water brings out a hint of wet wool and Vegemite. Clean with a lightly nutty start before it fattens out and sweetens in the mid-palate. There’s less cereal than on the nose, but it’s just a little flabby. Water helps to crisp things up and show more substance in the middle. A decent dram that just needs to be knitted together. Making bread on a moist morning. Batch 18 20/11/2015 Last of the Bowmore Devil’s Cask bottlings, a smoky anCnoc and the new NAS foursome from Glenrothes. Batch 16: Lidl Limited Releases 09/11/2015 The discount retailer’s seasonal Scotches, including three aged blends and two mature malts.